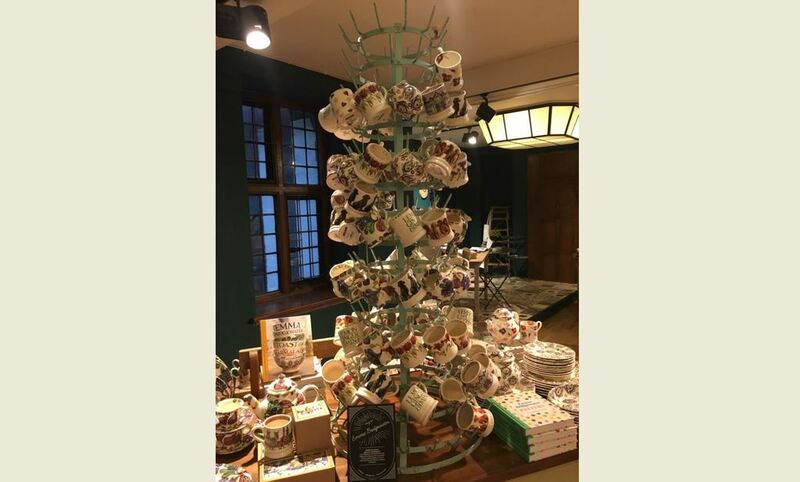 UKAA have recently been to London on a buying trip and while there we popped into Liberty's and noticed this beautiful display of Emma Bridgewater mugs hanging on an antique bottle dryer. Here at UKAA we have a lovely vintage bottle dryer perfect for displaying your mugs in a restaurant or cafe. For more information on any of our bottle dryers please do contact us on 01543 222923. Reclaimed Butchers Blocks as Kitchen Central Islands. Here at UKAA we always have a large selection of reclaimed and antique butchers blocks in stock at our warehouse in Cannock Wood. These vintage style butchers blocks are ideal to use as an extension of your kitchen worktops or are perfect to use as a kitchen central island. The old butcher's blocks have had many years of use and have developed a fantastic patina and look. Tags : Reclaimed Butchers Blocks . UKAA . Salvaged Antique Chopping Block . Reclaimed . Kitchen Islands. 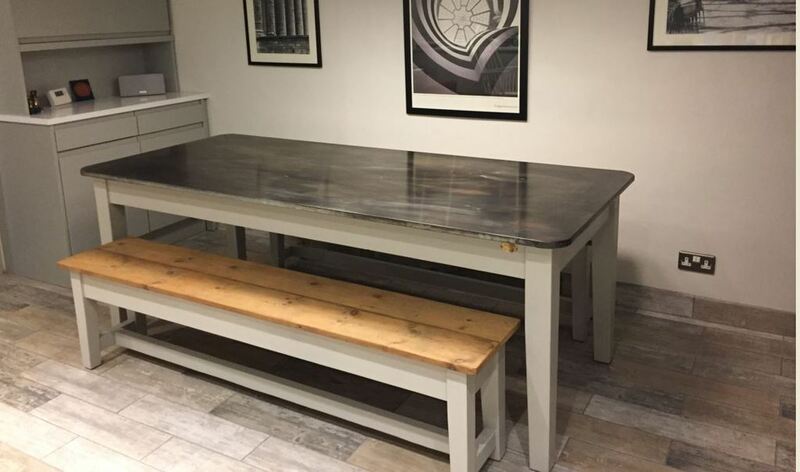 At UKAA we have just received this fantastic picture from one of our happy customers of her bespoke zinc table and timber benches. These bespoke items were handmade here at UKAA and delivered in time for Christmas. 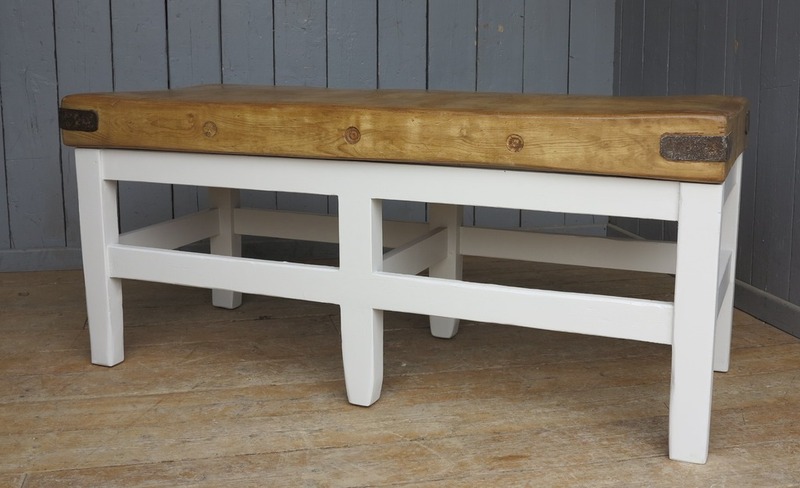 The table top is made from solid natural sheet metal with a reclaimed timber painted base. Both of the benches have seats made from Victorian pine floorboards which have been waxed in a stripped pine wax. For more information on any of our bespoke tables please call the team on 01543 222923 or we are available on live chat during office hours. Tags : Bespoke Zinc . Wooden Bench . Handmade . UKAA . Reclaimed . Natural Zinc. Here at UKAA we have recently received this picture from one of our happy customers. 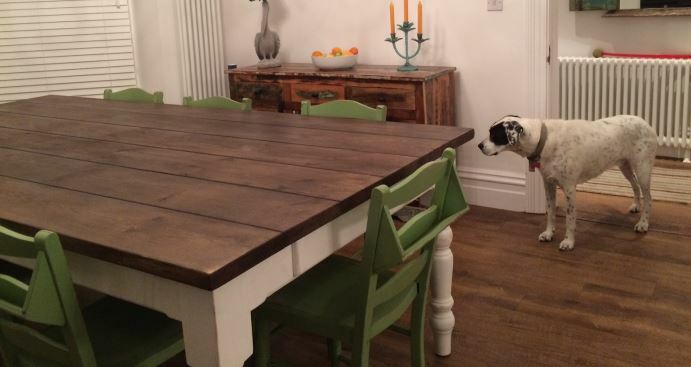 This bespoke wooden plank top table was made by hand onsite at UKAA by our team of skilled joiners. The chairs pictured are reclaimed Victorian chapel chairs that we have painted in Farrow and Ball Yeabridge Green to give them a contemporary look. For more information on any of our bespoke tables please call the team on 01543 222923.